The following are various publications and papers that we have written, along with the Manuals for the Expert AutoStats ® program and the 4N6XPRT StifCalcs ® program. To provide one example of software cost, and cost recovery, we have prepared an economic analysis scenario for the purchase and cost billing to your clients based upon our software. Of course, you know your clientele and what your region can stand as far as your billing is concerned, so you should consider this to be a model that you can change to suit your situation with regards to cost recovery. The 4N6XPRT Software Economic Analysis can be downloaded by clicking on the link. At the WREX 2016 conference Daniel Vomhof III presented the poster "Equal Spacing NOT Required for Speed from Crush Calculations - or - Equally Spaced Crush measurements - take them in the field or in the office - which is the better location? [6.9MB]" which explores the necessity of taking equally spaced crush measurements for the purpose of speed from crush calculations, as well as if equally spaced measurements are desired/required, where is the best place to take them. The background paper for the poster can be downloaded from the above link. The background paper also looks at some of the considerations with regards to the appropriate Crush Length to be used along with use of the Force Balance calculation module contained in the 4N6XPRT StifCalcs® program. 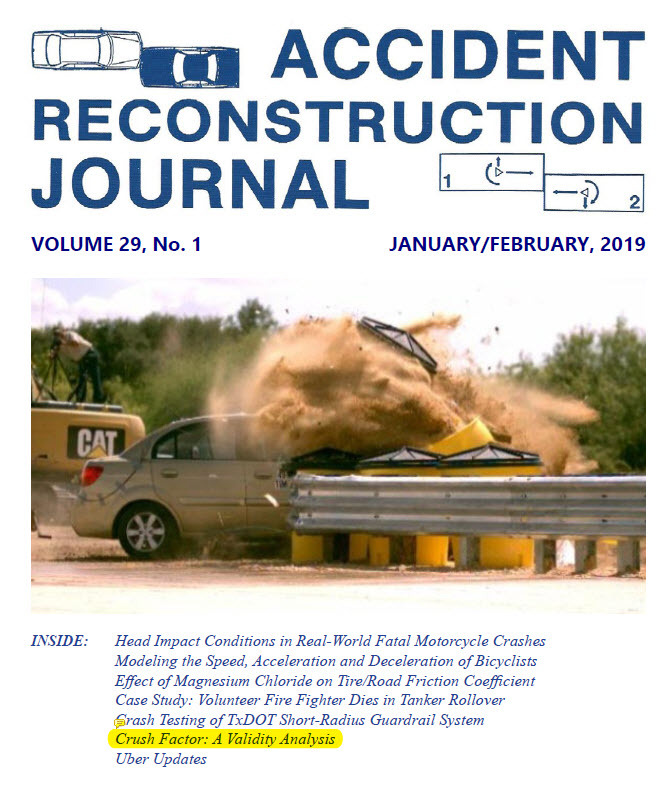 An article titled "CRUSH FACTOR: A VALIDITY ANALYSIS - PART I (FRONTAL) [1.4 MB]" by Daniel Vomhof III and Daniel Vomhof Ph.D. was published in the January-February 2019 issue of the Accident ReconstrcutionJournal. This article reviews and analyzes the origin and accurascy of the Crush Factor in Frontal Speed From Crush analysis. There are 9 Figures in this article which are tables of analysis results. The tables are, .... small .... through no fault of the Journal, the authors (primarily Daniel Vomhof III) assumes that responsibility as he could not figure out how to break them up into samller chunks without losing meaning. In an effort to help lessen that effect, the tables are available here in jpg format for easier viewing and printing in a larger size. The data analyzed comes from the NHTSA Crash Test Database as downloaded on May 12, 2017. Narrow-object equations based on maximum static deformation are available for collisions that involve the front of a passenger vehicle. However, most of these equations are not suitable for use in a narrow-object collision that involves the side of a passenger vehicle. Most of the equations are strictly derived or modeled for the front of the vehicle. Three lateral pole crashes were conducted as part of the 2008 Annual Joint Conference in Atlantic City, NJ on October 14, and October 15, 2008. The conference was hosted by the New Jersey Association of Accident Reconstructionists. The purpose of the tests were to determine if the CRASH3 energy equation, the Vomhof CF method, and the Morgan and Ivey equation accurately predict the impact speed of a test vehicle. The results varied depending on how the collision force was calculated. However, due to the limited number of tests, a recommendation as to which method will produce the best result is not possible. Nevertheless, some important information may be learned from these tests. Further testing must be performed and a suitable method for estimating the collision force in a lateral narrow-object impact must be found. Dr. Vomhof's paper [400K] presented at CRASH'98 on the origin and use of the Crush Factor [400K] as published in the Expert AutoStats program. Mr. Vomhof's paper presented at CRASH'98 comparing the Crush Factor as published in the Expert AutoStats program vs. A-B-G stiffness values [1.9 MB] for Ford Thunderbirds. 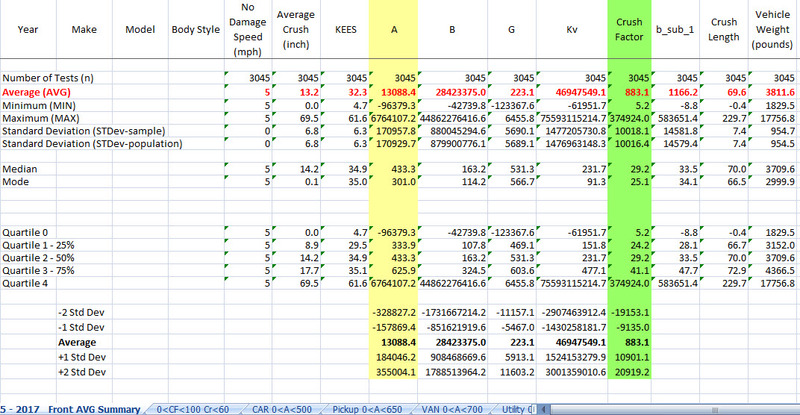 Utility vehicle rear impact tests are VERY limited in the NHTSA crash test database. A list of the Utility Vehicle Rear Crash Tests [130K] with associated stiffness values based on average and maximum reported crush depths, as generated from the 4N6XPRT StifCalcs program in 2005, can be downloaded by clicking on the link above. Mr. Vomhof's paper on why the KE Equivalent Speed (KEES) [500K] needs to be calculated for side and rear impact tests in the NHTSA Crash Test database. The Spring 2008 (Vol 12 No. 1) issue of " First Contact: The Newsletter for Crash Investigators" put out by IATAI - Illinois Association of Technical Accident Investigators contained an article by Mr. Vomhof entitled " Braking Effectiveness Lessens at Higher Speeds" Is Still True Today?? [ ~460K ]. A reprint of the article as submitted can be downloaded by clicking on the link. This article looks at and compares braking tests published for 2006-2007 model year vehicles which were tested from 60 mph braking to a stop as well as either 80 mph or 100 mph to a stop. The spread sheet containing this data can also be downloaded using the link below so that you may look at the data via different sorting criteria in ways that were not presented in the article. Dr. Vomhof's paper presented at the F3T2 conference in Houston Texas, 9/17-21/2006 " Human Error - But Which Human and Whose Error" [14.7 MB] can be downloaded by clicking on the link. Also, for a limited time and article referenced by Dr. Vomhof regarding Human Factors in Traffic Engineering may be downloaded.